Diving the Chesapeake Bay for oysters after a late season hurricane, former S.E.A.L. Ben Blackshaw discovers the recent wreck of a speedboat mired on the bottom. It’s jammed with millions in gold bullion, and one other box that turns out to be a suitcase dirty bomb, its timer counting down to zero just twenty-four hours away. But the real shock is the corpse of a drowned man at the helm of the wreck; a man Ben has not seen in fifteen years. His father. Ben learns his father stole the gold and the device from an Iran-Contra style government black-ops deal. Maynard Chalk, the agent who let the deal go south, wants the goods back to save his own skin. Chalk and his jackal henchmen descend on the quiet, god-fearing people of Ben Blackshaw’s Chesapeake home, Smith Island, determined to recover what’s theirs no matter the cost in innocent blood. Ben Blackshaw and his wily Smith Island neighbors must set aside a growing mistrust that naturally attends such an influx of wealth and power. They decide that recent desperate times can be set right if they manage to keep this orphaned gold for themselves and somehow stop that bomb. To do this, they must tap into the Island’s darker pirate heritage. Not seventy miles from Washington, D.C., they make a desperate last stand against Chalk. If they fail, Ben’s gamble will be the opening skirmish of World War Three. Deadrise is the first novel in the Ben Blackshaw Series. Nitro Express is the second exciting installment. Deadrise now available in German through LUZIFER-Verlag. Currently ranking in the top 100 bestselling kriminalthriller titles on amazon.de! Deadrise has been named to the Conversation Book Club top 100 books of 2012. From the very first chapter it is clear that DEADRISE is a novel that takes you captive and won’t let you go until the very end. Whitehill has done lovers of action and suspense a great service with this debut, and we must thank him for it. If you loved the Jason Bourne series, and are looking for an action-packed novel that will keep you on your toes with twists and turns until the very last sentence, then you must read Deadrise! 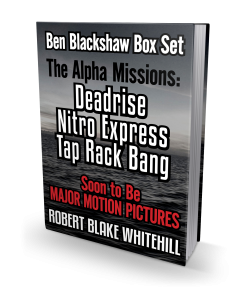 This debut Ben Blackshaw novel will have you buying the second book, Nitro Express, the minute you finish the first! That is why we at HatLine are thrilled to bring Deadrise to the big screen. I first heard of Deadrise this year when I was reading about the Chesapeake Bay Buyboat Winnie Estelle. I have a long history with the heritage of the Chesapeake Bay. Smith Island is a country all to it’s own and unlike it’s sister island Tangier, needs help to save it from sinking into the Chesapeake Bay like Holland Island. The premise got me to buy and start the book, but the author’s words kept me on my proverbial seat the entire read. I finished it in a day with very few stops. Even if you do not like to read but like non-stop action you will love this book. It has all the ingredients to rival Tom Clancy, John Grisham and the like. If you get a chance come to Crisfield and take the ferry over and see the real life Smith Island…Hope you enjoy this book. 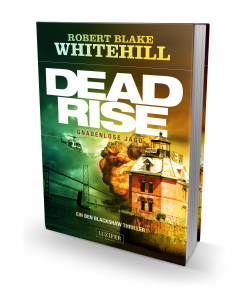 Robert Blake Whitehill steams onto the crime fiction scene with his Chesapeake Bay based thriller, DEADRISE. This cracking good tale of mysterious fortune combines irreverent characters, history driven invention, snappy dialogue, artfully managed conflicts, and startling surprises in a sensational count-down-style treasure hunt. Ben Blackshaw, the hero of DEADRISE, instinctively stays one step ahead of his pharmaceutically fueled sociopathic nemesis, Maynard Chalk. Dispatched by his boss to reclaim her lost cargo of gold and a dirty bomb from Smith Island, Chalk shrewdly and crudely manipulates his bloodthirsty gang of bastards, and even spawns an unusual alliance with Tahereh, a beautiful yet disillusioned Jihadi warrior. The characters who surround Blackshaw include his smart, take-no-nonsense Natural Resources Police officer girlfriend LuAnna, his impassive oyster culler Knocker Ellis, and the proud watermen and women of Smith Island. Using their ancient tidal folkways, they are all determined to defend their infernal inheritance to the death. It’s that, or the end of the world. Deadrise takes the thriller/espionage genre to another level by introducing a character whose cultural background is more important than his military experience. It’s not a stretch to say that the Chesapeake Bay, and Smith Island in particular, are the true protagonists of this book. Robert Blake Whitehill pits the traditional, solid independence of the Bay’s inhabitants and landscape against the modern chaos of terrorism and international intrigue. The conflict between these forces makes a bold statement about the resilience of the Chesapeake’s culture and its importance on the international stage. In Whitehill’s thriller, an unearthed treasure comes with the promise of wealth—along with covert operatives who will do whatever necessary to retrieve their loot. While diving for oysters in the Chesapeake Bay, former Navy sniper Ben Blackshaw identifies the body of his father, who abandoned him 15 years ago. The shipwreck nearby bears a fortune in gold, but when Ben and his sole crewman, Knocker Ellis, return under the cover of darkness, the salvaged gold comes with a bonus: a nuke that they’ve inadvertently triggered with a 24-hour timer. Maynard Chalk, working for a corrupt senator, desperately needs the booty and the bomb because his shell company was a go-between for two factions anticipating the delivery of their goods in a couple of days. There is a sense of wariness among the characters that envelops Whitehill’s debut novel. Distrust adds dimension to Ben’s interaction with people on his island home—a boatman’s curiosity may or may not be innocent—as well as Chalk’s knowledge of terrorists actively looking for the device. A hardy action sequence is ignited by multiple villains making their way to the island and the islanders arming themselves to defend their homes. As for the male characters, none are quite as unforgettable as Chalk, an outrageous antagonist whose animosity for nearly everyone but himself is complemented by a stunning amount of charm. He’s a man who’d suggest using the bomb because he’s bored and wants “to put the fun back in dysfunction.” A familiar plot that pushes itself above average thanks to a brooding ambiance and a scene-stealing baddie. Deadrise is an action packed suspense thriller! Unlikely protagonist Ben Blackshaw contends with international intrigue and the dangling loose threads of his own dark past, while moving fast and furious in a desperate struggle to defend from unspeakable evil both the people he loves and the community that nurtures him. Masterfully written, Deadrise is a non-stop adventure of political machinations, double dealings, covert operations, and Deliverance-esque ingenuity. Sure to leave you champing at the bit for the next installment, the adroitly tuned voices of Ben and his arch rival draw you inescapably into the dangerous world Mr. Whitehill has woven, enticing you to more, like a pusher handing out free samples of a new high. Deadrise will surely excite and surprise!